alaTest has collected and analyzed 19248 reviews of Apple iPhone SE. The average rating for this product is 4.5/5, compared to an average rating of 4.1/5 for other Cell phones for all reviews. Reviews about the portability and battery are on the whole positive. The performance and usability also get good comments. Comments are divided on the reception. There are some negative views about the text input. We analyzed user and expert ratings, product age and more factors. Compared to other Cell phones the Apple iPhone SE is awarded an overall alaScore™ of 92/100 = Excellent quality. alaTest has collected and analyzed 284 user reviews of Apple iPhone SE from Amazon.com. The average user rating for this product is 4.3/5, compared to an average user rating of 3.8/5 for other Cell phones on Amazon.com. Views about the price and design are on the whole positive. The usability and size are also mentioned favorably, whereas some have doubts about the reception. 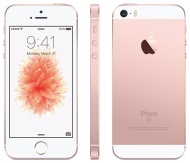 Apple is taking a step back in time with its latest phone, the iPhone SE – hailed by the company as "the most powerful 4‑inch phone ever". Looking for the best smartphone? See our latest smartphone reviews . This phone is the BOMB! Bought it for my wife as she's used to iOs but wasn't happy with the size of her iPhone 6. SE is a good option - small yet capable with enough memory on board. Otherwise it's an iPhone - solid build, good quality, good camera. All the you would expect.